Welcome to the nations best chrome plating solution for your bike. Performance EDGE has been offering show quality "wet chrome" service to customers/dealers across the US, and around the world, since 2003. Chrome plating aluminum has always been a tough task, due to the inconsistency of aluminum content in which parts are made during the "mold casting" process. With the proper preparation, and close attention to detail, we can provide you with a superior chrome finish that looks better, lasts longer, and produces a brilliant lustrous finish for your parts. Our standard 5 layer chroming process for aluminum parts and wheels consists of a chemical wash that strips the part free of paint and finishes, then multi-step polishing process to remove imperfections, chemical etching bath, nickel plating, copper plating, semi-bright nickel plating, bright nickel plating, and finally a chrome layer plating. All parts are polished after each layer of plating to ensure that when the final layer of chrome plating is processed, your parts look "wet". This is the name our first customers gave our chrome processing in 2002 as describing our process as: "the wettest chrome around" and "liquid chrome". As with chrome, there is always a choice that's available that's less expensive. You've heard before "you get what you pay for". This is also true when it comes to chroming. "Less expensive" means shorter prep time, cutting corners with polishing, and less frequent maintenance and chemical changes in the plating tanks. The outcome? Chrome that doesn't have the reflective qualities that you would expect, and reduced longevity of the chrome plating is also common. The proper prep, additional polishing time, additional layers of plating, routine maintenance on plating tanks, and frequent changing of the plating solutions ensures that your parts turn out right the first time; with the best chrome adhesion properties with aluminum in the business. As our customers have mention to their fellow riders to explain the quality of our work, "Its the best chrome out there, period". Warrior, Raider, Stryker, and Roadliner rear hubs are instock, ready for immediate exchange! Your rear hub is carefully diss-assembled, chrome plated, and re-assembled. All bearings and studs are removed for this service, and then installed for you, labor is included in the price. This is a perfect compliment for a chrome rear pulley. 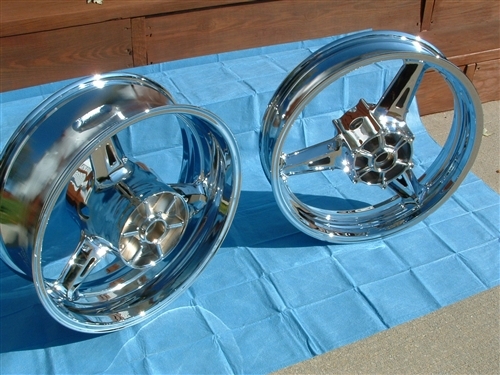 Beautiful 5 layer "wet chrome" for your multi-spoke HD rims. Each spoke hand polished to ensure optimum lustrous chrome finish. Its the best finish of chrome on aluminum in the United States, hands down!